Investors holding General Electric (NYSE:GE) shares in their portfolios should be very pleased by several important aspects of GE earnings. They should also, of course, be very pleased by the double-digit-percentage rebound of General Electric stock today. First and foremost, the green shoots that I’ve previously cited for the Power business seem to have begun their positive influence on the unit’s results. Specifically, the Power’s orders last quarter rose to $7.9 billion, compared to $6.62 billion in Q3. The division’s top line increased to $6.76 billion, versus $5.74 billion in the prior quarter. While its Q4 revenue dropped 25% year-over-year, that was markedly better than Q3’s 33% year-over-year tumble. Although the unit’s profitability deteriorated in from the previous quarter, that’s likely because of the tremendous expense of replacing defective turbine blades. Of course, that expense should ease significantly at some point; probably, I would think, by the end of this year. Perhaps most important for the impact of the Power unit on GE stock, CEO Larry Culp indicated that he expects its revenue to be “down to slightly flat” this year, according to notes of the GE earnings conference call provided by Seeking Alpha (I think he meant slightly down to flat). That’s a far cry from the continued, wide-scale deterioration of the Power business that most GE stock bears were likely expecting. Moreover, largely because of the stabilization of Power, Culp expects the company’s organic industrial revenue (that is, its industrial revenue excluding the impact of any acquisitions) to actually increase this year. I’m sure that’s another statement that the GE stock bears didn’t expect to hear. One of the most surprising aspects of GE earnings was revenue surge of its Renewable Energy unit, up 28% year-over-year as the division’s orders jumped 19%. Perhaps showing that new leadership can quickly make a huge difference, the impressive growth came after the unit’s revenue increased by an average of 4% in the first three quarters of the year. Although the unit’s Q4 profits tumbled 51% year-over-year, GE blamed that decline on price, execution delays, and restructuring costs related to a major acquisition. Execution is likely to improve under Culp, while restructuring costs will fade away. As for price, Culp is probably following the time-honored business strategy of offering low prices to make more deals and then raising prices once the products have been proven to work and the customers are satisfied overall. As such, I expect the unit’s profitability to surge by the end of this year. Importantly, Culp said he expects the Renewable’s unit’s revenue to increase by at least 10% this year. Furthermore, GE earnings showed that the Aviation unit continues to fire on all cylinders, as its revenue jumped 21% year-over-year, and its profits surged 24% year-over-year. 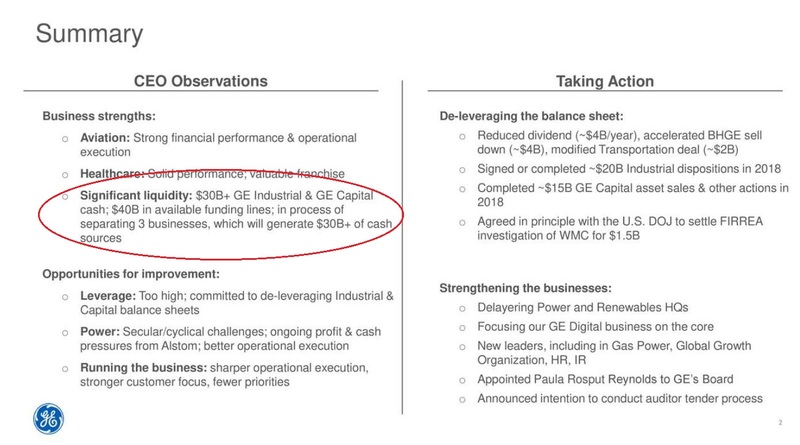 According to a slide released in conjunction with GE earnings and posted by Seeking Alpha, GE, under a heading titled, “Significant liquidity,” stated that it has $30 billion+ of cash, “$40 billion in available funding lines; and is “in process of separating 3 businesses, which will generate $30 billion+ of cash sources.” That adds up to at least $100 billion. As I’ve noted previously, the company reportedly only has $26 billion of debt coming due through 2020. Moreover, based on my analysis of the company’s balance sheet, its total liabilities are about $255 billion, but that includes loans and other liabilities that may not be due for many years. In general, I think that owners of General Electric stock can rest pretty easily for now, given the company’s representation of “significant liquidity” and the fact that its available funds are so far above the loans that it will have to pay back through 2020 and not too shy of its total borrowings. Moreover, some of the company’s longer-term debt can likely be restructured, if necessary. As of this writing, the author did not own shares of any of the companies named. 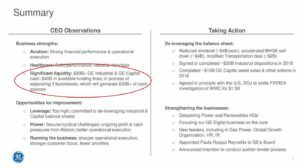 Article printed from InvestorPlace Media, https://investorplace.com/2019/02/3-reasons-for-ge-stock-investors-to-cheer-ge-earnings-as-sign-of-future-nimg/.